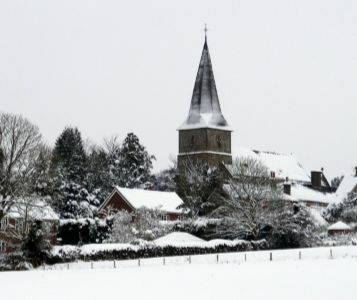 Introducing a very active fundraising charity linked closely to All Saints’ Church, Old Heathfield and St George’s Church, Broad Oak called FASCOH – ‘Friends of All Saints’ Church, Old Heathfield’. When visiting a new sizeable town or city we look to find if they have a sight-seeing tour operating on an open top double decker bus to introduce us quickly to the interesting and historical areas. We find that this provides a good introduction to the places that are worth visiting and finding out more of the history of the buildings. Dublin, Oxford, Windsor, Sydney, New York and of course London. One of the distinctive features that each of the areas provide are the ‘spires’ on the many churches which have stood the test of time over the years. Some of the places, and take Salisbury for example, one is left wondering how on earth the tall spire, which can be seen from miles around, was originally built and my ‘cynical’ mind asks the question as to how many of the builders actually lost their lives by an accident during the construction time. They did not have modern scaffolding and no health and safety regulations like today! But look across almost any skyline and you will see countless numbers of church spires belonging to churches of all denominations. In reality it seems that the older the church building, the higher the spire is. There is something in the Bible which talks about a city that is set on a hill – and a city or community nearly always had a church – and the church nearly always had a spire. When one travels up towards Old Heathfield from Vines Cross, having been directed by the road sign in Vines Cross that Heathfield Church is just up the road, or you look across the fields from Warbleton church, there is one thing which dominates the sky line, and that is All Saints’ Church and it’s spire. It was not too many years, in fact about fifteen or sixteen years ago that the PCC members of All Saint’s Church were so daunted by the news that the spire of the church was in need of major repair with a cost running into many tens of thousands of pounds. It was a task that many of the members thought was impossible to address and to raise the necessary monies. Perhaps the easiest way was to take the spire away, thus eliminating the cost of repair and future maintenance! Thankfully there were some members who had a vision and the initiative to think otherwise. The church as a body of worshipping members was a sacred place, but also there were and still are people in and around the area of Old Heathfield who simply loved the church and all that it stood for although not necessarily regular attending members. Out of this came some creative thinking and research as to what other parishes across the diocese had done, with the resulting proposition that due consideration should be given to creating a new and independent Charity, autonomous of All Saints’ Church and the Diocese of Chichester, yet totally supportive by its designed objectives within the life of All Saints’ Church and St George’s Church. 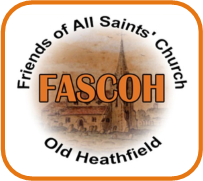 So the seeds of the Friends of All Saints’ Church Old Heathfield (FASCOH) were planted and this new, exciting and vibrant Charity was formed and registered with the Charity Commission with expert and legal advice given in the drawing up of the legal documentation. Together with gifted, experienced and committed trustees taking hold of the task of addressing the major costs to maintain the 13th century medieval building, FASCOH started to burst into life and soon their recommendations were gratefully accepted by the PCC church members of the day. Still the trustees of FASCOH have a commitment to the role of the charity with each of them contributing to the activities by using their day to day gifting and experiences. Many of the original members area still in touch and involved. 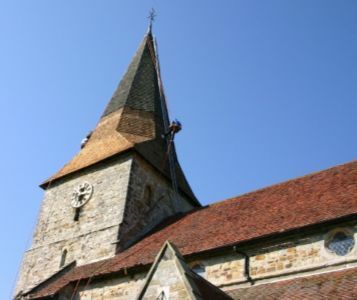 At a recent FASCOH Annual General Meeting, the report was given that since the establishment of the Charity, £210,583 has been raised resulting in the spire being fully restored; the reformation of the west end of the church; the provision of The Space with toilet, kitchen and office facilities, together with the new bell tower formation and recently the installation of the renewed heating system in the church. The trustees made the decision some years ago to not only continue with their primary task of major fundraising, but also to serve the local community in and around Old Heathfield and Cade Street by staging a series of regular Thursday Topics. These have continued to be popular with a diversity of subjects presented – historical subjects from around the locality - various musical presentations, gardeners question time and a very interesting and informative visit from the Raystede Animal Rescue Centre at Ringmer. Other evenings have included a virtual and illustrative tour of the Palace of Westminster; Pauline McIldowie who has researched many volumes of historical data from our local archives presented a ‘History of Old Heathfield, Cade Street. FASCOH has enjoyed the support of friends who purchase tickets for the 100 Club monthly event. 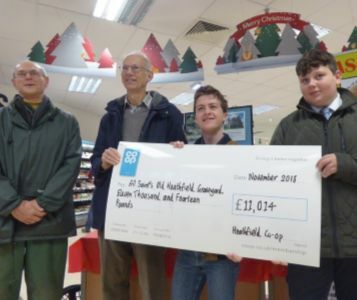 This effort over the past 4 years has raised a considerable sum of money, whilst participants also have a ‘bit of fun’ awaiting the monthly results from the draw. FINALLY, the trustees greatly value the support of many members, local charities, local businesses and major fundraising institutions across the country. FASCOH together with the Parochial Church Council is currently addressing the ongoing maintenance of the graveyard and the public right of way on behalf of the local community and they were successful in obtaining a grant from the Co-op in November 2018 which totalled £11,041 for this work.